Friction welding offers improved efficiency in part fabrication. Recent news about international efforts to reduce carbon dioxide (CO2) emissions made us wonder. Does our efficiency contribution help this environmental effort? Dollars saved are always important but using that same data, let’s look at energy saved and CO2 emissions eliminated. Friction welding efficiency centers on delivering Near-Net shapes. Other means, like forging, casting, cold-forming, and upset forging also provide Near-Net shapes. However, millions of small-order parts make up an immense swath of industry that is untouched by these other methods because of order volume requirements and extensive lead times. If we consider all the parts made by Original Equipment Manufacturers (OEMs) and their supply chain, there is a staggering volume of metal being cut from oversize stock to make parts. These parts are essential but consumed in quantities too small for typical Near-Net fabrication. Do you think that maybe as many as 1,000 of these jobs are run in CNC departments around the country? What would be the impact of an 80% reduction in resource consumption be for that one component type? 34 full semi-trucks not driven. 3,800 Tons of coal not burnt, mined, or transported. 6,117 Tons of CO2 not emitted. 1,130 Tons of minerals not mined. Maybe your most important resource saved is the 6,000 hours of machine time not spent “hogging” away material. Focus on the small and moderate part runs that start by hogging away material from large billet and bar stock. Opportunities to save energy, reduce CO2 emissions, and cut toxic pollution are fulfilled by eliminating this practice of cutting away unwanted metal. This wasteful cutting procedure is going on around the clock in manufacturing operations in every corner of the world. We are going to zoom in on a typical small order of friction welded Near-Net blank shapes that will feed a machining operation. Regular readers will understand that the solid fusion of material and strength of friction welding make it interchangeable with solid billet. Extrapolating data from that small lot, we can begin to see how changing this metal hogging habit can help to save the environment and your bottom line at the same time. 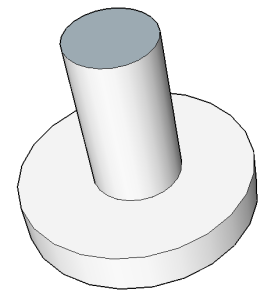 The process is measured in comparison to cutting the same shape from full diameter bar stock. You can click to see a video of the two methods running side-by-side. To assess the environmental impact, the “Embodied Energy” of the stainless steel is counted. Embodied energy is a sum of all energy expended to produce the machine-ready bar stock. It accounts for processes from mining, shipping, smelting, and rolling. Then we add the trucking to move the bar stock to machining operations and on to assembly. The processing of scrap has to be accounted for as well. Finally, we measured electric energy spent to turn the bar in a CNC compared to friction welding net size bars together. The Energy Total consumed for a Full-Bar CNC lathe turning Job Lot comes to 7,087 kWh. Industry figures for CO2 output on energy spent show .001 U.S. tons per kWh. Therefore this job run the standard way by cutting down bar stock to net size generates 7 (U.S. short) tons of CO2. The results from running the same job as Friction Welded Near-Net shapes show improvement primarily from material reduction. The single job lot of 16 pieces saves 598 pounds of material. This allows us to subtract “Embodied Energy” for the material, reduce trucking, eliminate scrap handling, and reduce energy consumption for machining. Embodied Energy in stainless steel is in the range of 14,000 to 15,000 kWh/ton. 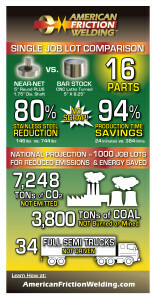 The total of all these improvements equals resource savings of over 80%. That is a 6-ton reduction of CO2 emissions per 16-piece Job Lot. For the source data used to form this analysis, click here for your pdf copy of the worksheet.